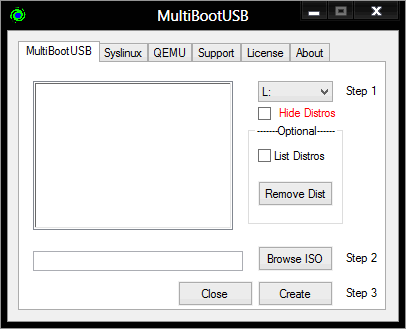 MultiBootUSB can put one or more bootable tools into a single USB drive, including any of a variety of Linux, FreeBSD and other operating systems. The program uses Syslinux for installing MBR and 7-Zip for extracting ISO images. It also uses a Windows version of CPIO program for installing certain distros. USB/ISO can be tested without reboot via a built-in QEMU program. How to extract: Download the installer and extract to a folder of your choice. Launch MultiBootUSB.exe. MultibootUSB v7.1.0 released -- it seems to be Python based now: http://multibootusb.org/get-the-latest-stable-version-7-1-0/.